Tracing the movements of France’s ill-fated Lapérouse maritime expedition in the late eighteenth century, Williams’ exceptional debut isn’t your traditional seafaring yarn and is all the stronger and more penetrating for it. The plot moves confidently between views of the changing landscape—from a crisply evoked Georgian London, where a naval engineer travels to procure supplies, and then on to Tenerife, Chile, Alaska, California, Russia, and the South Seas islands—and its characters’ choices and inner lives. The emphasis is not on fast-paced drama so much as on interactions among the two ship’s captains (Lapérouse and Langle), their crews, the numerous scientists on board, and the residents and natives at many stopping points. Williams’ status as an acclaimed short story writer is evident in her craftsmanship of each perfectly encapsulated chapter, each recounted from a different viewpoint or viewpoints. The section set at Monterey in 1786, for instance, demonstrates masterful use of perspective, as one revelation after another about the Spanish mission there comes to light. Full of period sensibilities, particularly the Enlightenment-era urge to go forth and explore new domains, the novel is alternately charming, invigorating, and heartbreaking, and always thoughtful and humane. Even readers who don’t seek out nautical adventures will find themselves drawn in, especially if they love high-quality literary fiction. Landfalls will be published in early August by Farrar Straus & Giroux ($26, hardcover, 336pp) and, in the UK, by Little Brown in October. This starred review first appeared in the April 15th issue of Booklist. Some additional notes: This book was such a wonderful surprise! I'm not the natural audience for a lot of historical adventure fiction, as I often find myself wading through jargon that other readers of the subgenre seem to crave, and I've read plenty of round-the-world-exploration novels and wondered if this one would stand out. It absolutely did, and I'm grateful I got the chance to read it. I am historical fiction fan, this subject is totally new to me, definitely I am interested in getting hold of this one. Thanks for the review. Glad the book caught your interest! Hope you'll also enjoy it - it does seem like your type of thing. Sounds DELISH. Just tweeted FSG to see if I can land a copy. So glad you reviewed this one -- it wasn't on my radar! Good luck getting a copy! I think you'd really enjoy it. At the time it showed up in the mail, I hadn't heard anything about it. I love those kinds of unexpected surprises. As a fan of nautical fiction I'm very interested in reading this one! Laperouse has an Australian connection too. He landed in Botany Bay, Australia, a few days after the arrival of the British in 1788. There is a Sydney suburb named after him. 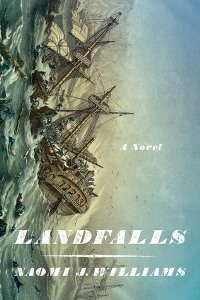 According to Naomi William's website Landfalls will also be available in Australia/New Zealand in August as a trade paperback from Little Brown. I'm glad of your review as I hadn't heard of this novel or author before. Thanks, Sarah! Hi Yvonne, that's great it's coming out in Australia & New Zealand also and that you'll be interested to read it. Some of the later sections take place in Botany Bay. It was an aspect of Australian history I hadn't been familiar with beforehand.